The TC1630 Fiber Optic T1/E1 Modem is typically used to link Channel Banks, PBXs, and M13 multiplexers to DSX-1 Cross Connects in Video Conferencing and Distance Learning applications. It is also used to link Customer Premises Equipment to CSU/DSUs and with metallic medium T1/E1 multiplexers to transmit over fiber optic cable. The Model TC1630 is a T1/E1 Fiber Optic Modem that offers advanced features such as Jitter Removal, Multiple LEDs and a replaceable Line Interface Module. Because it is based on modern FPGA (Field Programmable Gate Array) technology, it offers optimum flexibility, extremely low current consumptions and high reliability. A rackmount version is available as TC1630R. Transparent to the framing format, the TC1630 supports AMI, B8ZS and HDB3 line codes and DSX-1 (T1) cross connect distances from 0 to 655 feet. It includes an internal elastic buffer to remove jitter from transmit data. Eight LED indicators help installation and troubleshooting—one each for POWER, T1/E1, BPV, AIS, ALARM, O-SYNC, RMT1-0, RMTLB. Eight DIP switches, accessible from the panel, provide control settings for line code, line length, local loopback or remote loopback. The intelligent line code setting switch eliminates confusion—such as when the line code does not match the line length setting. 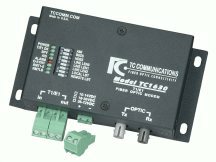 The TC1630 is compatible with all popular types and sizes of optic cable. Fiber optic connectors are ST; FC is optional. Special four-position and two-position feed-thru detachable terminals connect the T1/E1 twisted pairs. Input power is 12VDC, 24VDC, -48VDC or 115/230VAC with an external power cube. An extreme temperature (-20oC to 70oC), TC1630Q is available. NOTE: The TC1630 is 100% compatible with its predecessor Model TC1620. Weight (147.0 gm) 5.2 oz.